Debtors, local authorities, debt collection agencies and bailiffs will all benefit if and when the government finally gets around to introducing a fixed percentage fee for debt collection cases says Paul Husband, Managing Director of Collection and Litigation software provider Cogenda. To this extent he broadly agrees with the statement published by CIVEA, the Civil Enforcement Association, which argues for â€œAn adequate regulatory mechanism, unified law and fairer fee structure.... needed for all law enforcement agents to enable straightforward, effective warrant enforcement and offer protection to vulnerable debtors who genuinely cannot payâ€. Acknowledging that CIVEA has a particular interest in promoting the interests of its members, Paul Husband believes that local authorities would also benefit considerably from a published, transparent system which allows that there is a considerable difference between â€œhard-core wonâ€™t payâ€ debtors and those who genuinely want to pay but, perhaps temporarily, canâ€™t. A more open system, he argues, where local authorities had a range of providers at their disposal, would work to everyoneâ€™s benefit. For example, if standard procedure was to work through a debt collection agency with cases passing to the bailiff when a lack of willingness to co-operate was firmly established, this would not only be more efficient but less traumatic for co-operative debtors and less liable to adverse publicity for local authorities. â€œWe know that councils are between a rock and a hard place on collecting outstanding debtâ€, he says. â€œThey are exhorted to collect the money but often criticised for the methods employed. I canâ€™t remember the last time I read a local newspaper report congratulating the local authority for its collection rates and pointing out that this is a good thing for council taxpayersâ€. The visit of a bailiff, he contends, will always have a stigma attached to the debtor with honest intentions, unnecessarily characterising all debtors as obdurate and feckless. He believes the current system of engaging debt collectors and bailiffs is unnecessarily segregated and that a more joined-up system, with a percentage fee structure for bailiffs and DCAs alike, could be a far better solution. â€œWhen we were developing CogendaWorks, we soon began to see how such a system could help enable this kind of process, offering more flexibility but more control at the same timeâ€, he says. â€œSo long as your management software will flag up â€œnon-eventsâ€ like a failure to pay, as well as actions, then you can determine a rapid appropriate reaction. An integrated collection and litigation management software system, driving an integrated policy, which communicates, instructs and reports back, is the way forwardâ€. With or without government support, it seems likely that the combination of pressure for results and the seemingly incessant appetite of the consumer media for bad news bailiff stories will drive the move to a more integrated solution forward. on 26 October 2011 . When smaller DCA businesses are under pressure from rising basic costs such as fuel and utilities few are inclined to look at IT investment as a potential source of reducing operating costs. Paul Husband, Bromsgrove-based Managing Director of Cogenda Limited, says that more investigation may be needed. "I was told recently about a multi-national market leader with one of the biggest brand names in DIY whose thousands of employees are still using Internet Explorer version 6", he says. "IE6 came out in 2001, three years before Facebook was founded and almost ten years before anyone had heard of the iPad. Even though only about 1% of internet users are stuck on IE6, this major company is still operating in the internet dark ages." Even for the smaller business though, Paul Husband argues, keeping abreast of technology is much more than simply "techno-enthusiasm" or boy-toy gadgetry. Occasionally there will be a breakthrough in every market place that simply changes procedures for the better and offers measurable performance improvements. As a long-time member of the Institute of Credit Management and with more than three decades of first-hand industry experience, he is a member of that exclusive management group which both pre-dates sophisticated computer software and now actively markets it to others. His company's flagship product, CogendaWorks, claims to be the first software system in the UK that truly integrates the collection and litigation elements of debt collection. Ten years in the development, however, it is priced affordably for the small DCA. Just as significantly it is likely to deliver around 15% savings in the cost of processes and it will provide the means to ascribe accurately the cost elements of a case as it progresses. Not only does it seamlessly integrate the collection and litigation stages of case management, but it offers a reporting tool to measure the benefits. Realistically, he acknowledges that there is widespread cynicism about software claims. "Like everyone else I am aware of colossal failures, for example in the NHS where a very expensive system integration project was eventually abandoned. It cost Â£12billion, a sum which would pay 60,000 nurses for ten years." The root cause of such failure he ascribes to basic lack of industry experience, IT experts trying to make clever technology adapt to a specific market. "It's entirely the wrong way round", he argues. "Software applications need to come from inside the user community so that they are designed and fit for purpose, road-tested by people who actually need to use it in their jobs." CogendaWorks was co-developed with an associate business which has been active in the debt collection market for some 15 years. So confident is the business that its tag-line for the product is "works day one". Such a facility is seen by some as the Holy Grail for out-of-the-box software and it's perhaps the greatest reassurance to the small businessman. Negligible downtime, immediate benefits. 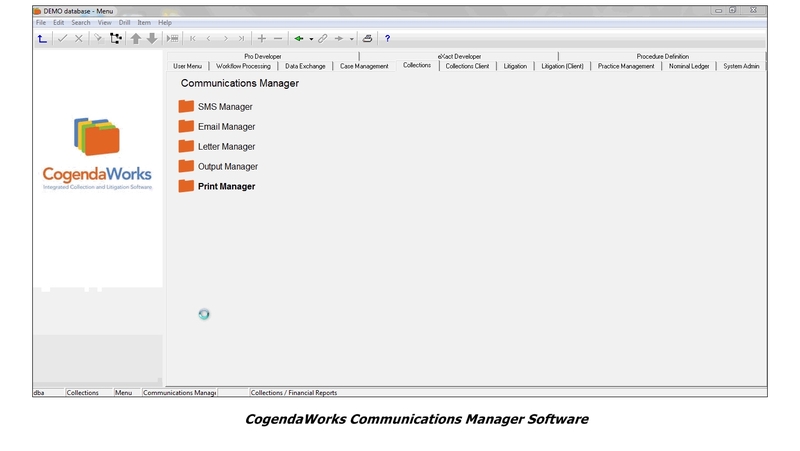 CogendaWorks manages the entire collection workflow process in one system with powerful reporting tools and high grade web-based interactive facilities. Defined as "an affordable solution that is easy to configure to the way you run your business" its appeal to the small DCA is simplicity and payback. Paul Husband is a passionate advocate for the small businessman and concedes that its business benefits, not technology, that hits the spot for him. "I think we understand what DCAs want because a number of us at Cogenda have either been directly in that line of work or been involved in the community that works with them. I'd encourage all DCAs to look at what current software systems can offer, not because I'm impressed by the technology, but because I know what it can do." CogendaWorks Communications Manager will save any business time and money on its collections and litigation process, says Managing Director Paul Husband. 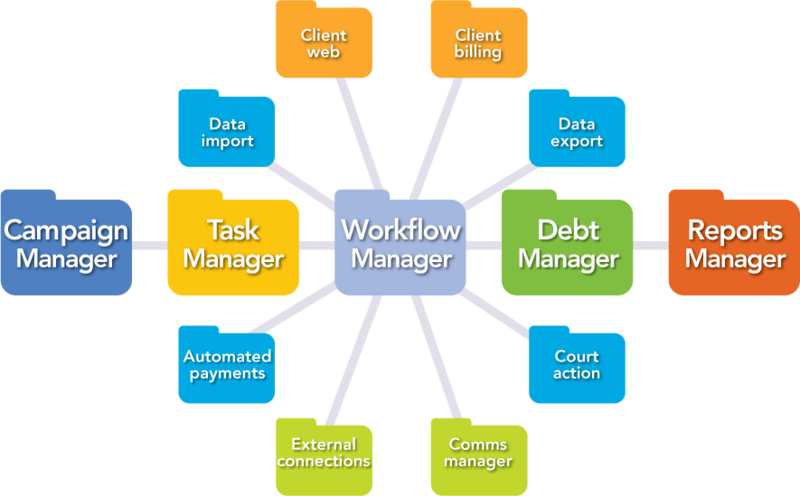 CogendaWorks was developed to be the most advanced software package available to the debt collection sector, providing an integrated solution for the entire case management process of collection and litigation. The Communications Manager function is at the heart of a completely automated messaging process which offers users the ability to build multi-level letter, email, text and fax campaigns. Contact rates should be significantly increased and the quality of the contact data held on site will be enhanced. CogendaWorks has an integral document production facility which allows users to control letter output and these may be printed in-house using traditional methods or sent externally via the system's output facility. So the end product is bespoke, controlled, highly targeted and even audited so that users can see the history of mailings and also the method used. The entire process will be more cost-effective. Not only is there no wastage but the task of creating and folding letters then stuffing envelopes can be avoided. Managing Director Paul Husband comments. "In field trials we found users making up to 80% savings on their administration time. The effectiveness of CogendaWorks is a direct result of its ten years development time combined with the hands-on experience of our senior management team in both the collection and litigation sectors." Alison Hornby, from Bromsgrove, is being sponsored by specialist collection and litigation software company Cogenda in an attempt to swim the English Channel. The swim will be the fulfilment of a lifetime's ambition for Alison, and in raising funds for Macmillan Cancer Support she has been motivated by the loss of her elder sister to the disease. The endeavour requires a year's preparation with a rigorous regime that will include winter training in a local lake and also in open sea conditions. Weather and tides permitting, the channel swim is expected to take around sixteen to eighteen hours. Alison's support team includes sister Susan Brooks and brother Steven Husband, along with Cogenda's Managing Director Paul Husband, making it a real family affair. The group are no strangers to charity swimming and the quartet are especially proud of their participation in the British Gas Great Swim, held off the Suffolk coast in 2009. Anyone interested in adding to Alison's fundraising can do so by visiting her website -	www.justgiving.com/alison-hornby and she is looking forward to the challenge. "We have one life to live and I believe we must take every opportunity to achieve our ambitions, not just dream of them", she says. "Macmillan nurses help cancer patients to enjoy a better quality of life, so in dedicating my swim to my sister I am celebrating her life too. I cannot think of a better cause." Paul Husband comments "We are delighted to be helping Alison's cause. From my personal experience she is a dedicated and highly capable swimmer and I have no doubt she will achieve her ambition. We will be reporting the news of her training and preparation on our website at	www.cogendaworks.com. on 03 August 2011 . Cogenda, a Richmond Surrey headquartered company, has launched the UK's first comprehensive case management software offering an integrated collection and litigation package. CogendaWorks is the product of 15 years development. Designed to reduce the complexity and speed up the process of case handling, it allows case workers and administrators to manage data entry together with all the associated processes and corresponding paperwork. As each case is progressed calculations are made, key dates recorded, postings automatically recorded in ledgers and documents written to print queues. The systems efficiency and ease of use will be welcomed by companies under pressure on costs and in extended field testing the product is estimated to have reduced administration time by 80%. One new user reported that "the last software package I used took me two months to learn, this one took me two days". It is expected that CogendaWorks will have immediate benefits for credit managers, debt purchasers, debt collection agencies and solicitors' practices. At the heart of the system is a powerful campaign management tool which allows the user to create campaigns and multi-level workflow strategies based on any set of user defined criteria. Managing Director Paul Husband says the launch of CogendaWorks sees an ambition realised for himself and his team. "Cogenda's board of Directors is made up of both IT specialists and people, like myself, with decades of experience in the debt collection and litigation sectors. So this product is not just technically impeccable, it does what the customer wants. Perhaps our strongest proposition to customers is that the product will work on Day 1! Like most other businessmen I've become slightly cynical about certain software products. That's why we have spent so much time in development and field testing of the product, to make sure that CogendaWorks will deliver on its promise. We believe that with installation likely to take just half a day, CogendaWorks is going to appeal to operational staff and line managers, right up to Financial and Managing Directors. You install day one, it works day one, you start to get the benefits day one." Potential clients can see for themselves what CogendaWorks offers by accessing the demonstration area on the company's website at	www.cogendaworks.com.